The Framers of the Constitution established an ingenious method for electing a President for the United States. 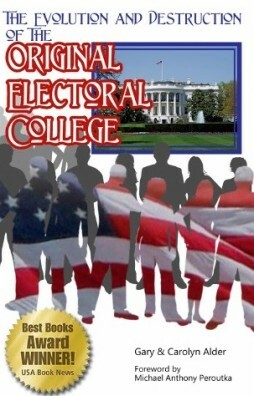 Tragically, the constitutionally defined process, the original Electoral College system, did not receive a fair experiment before self-serving interests and political party machinations quickly destroyed the constitutionally designed system to protect freedom. Constitutional government was abandoned and replaced by party government. The president of the United States is elective, and what is a capital improvement on the best government, the mode of chusing him excludes the danger of faction and corruption. It is clear, in the Senate debates on the 12th Amendment, which was hastily ratified in 1804, that most of the senators did not understand or appreciate the beauty of the electoral system established by the Constitution. A few like Samuel White (Delaware), William Plumer (New Hampshire), and Uriah Tracy (Connecticut), unsuccessfully tried to convince their colleagues not to tamper with the structure of the design. As Samuel White stated, “we have not given it a fair experiment,” and “we should be cautious how we touch it.” Samuel White also demonstrated how the political parties had taken over and controlled the Electors in opposition to the original intent. He indicated that under the proposed 12th Amendment, the choices would be effectively reduced to two (one from each party) and that would “more than double the inducement to those candidates, and their friends, to tamper with the Electors, to exercise intrigue, bribery, and corruption…”. The 1787 Constitution established a truly unique American constitutional federation; or as stated in the Preamble, “a more perfect union.” It was specifically structured to protect freedom. The federation was balanced by creating one house to represent the state governments, one house to represent the people in national issues, an executive to represent the Union of the States and a judicial branch to make sure laws stayed within the bounds set by the Constitution regarding both procedure and content. Every office at the national level was designed to be filled using a different method of selection. Each method represented different interests and insured that those making the appointment or election were competent to make the selection. It was not a democracy of the people electing every office. The Framers had discussed and rejected the option of electing the President by popular vote. The only office whose members were to be elected directly by the people was the House of Representatives. The Constitution does not describe and define a party system. It was not designed to be run by political parties. The procedure for electing a president was designed to avoid all party methodology including campaigning, office seeking, intrigue and cabal. If someone was seeking the office, it was a sure sign he was not the man for the job. The choice of several, to form an intermediate body of Electors, will be much less apt to convulse the community, with any extraordinary or violent movements than the choice of one who was himself to be the final object of the public wishes. The duty of the Electors is precisely defined. They are each to bring forward two candidates fully qualified for President, because they cannot know at the time of giving their ballots upon which the choice will fall. They shall make a List of all Persons voted for, and the Number of Votes for each; which List they shall sign and certify, and transmit sealed to the Seat of the Government of the United States, directed to the President of the Senate. All of the Certificates would be opened in joint session of Congress and the Votes then be counted. The counting of the votes, so carefully protected from control or manipulation, determined the candidates. This is where the beauty of American constitutional federalism came into play as a majority vote of the States would nearly always make the final choice for President from the 5 most nominated individuals by the Electors. This election would take place in the House of Representatives, immediately following the opening of the Electors’ sealed certificates with each State having one vote. Unless there is a tie, there is no vote for Vice President. He is designated by the original Constitution as the one remaining with the most electoral votes after the President is selected. The candidates are nominated by a procedure totally outside of control or influence of the Federal government where the most populous states have the biggest say, but the President is elected by a branch of the Federal government acting with equal say regardless of population—a truly Federal system.